The cold season is in full force! 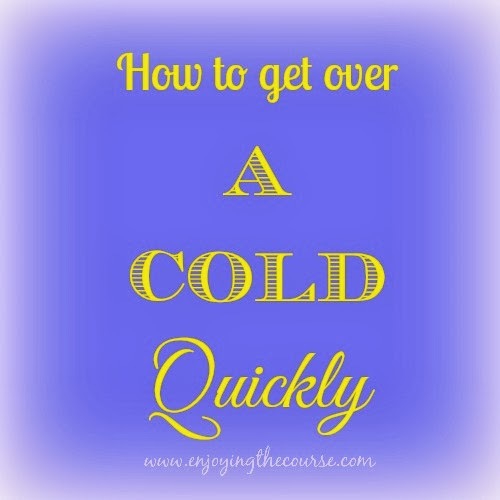 What is the fastest way to get rid of a cold? Here are my best tips. This is almost always my downfall. I really struggle with getting in enough water each day, but it's so helpful in getting over a cold. Water is the best, but drinking other fluids is great, too. Just try to get in as much liquid as possible. Here are some tips on how to drink more water. It's natural for you to experience a loss of appetite. When you do feel like eating, try to consume things that are full of nutrients like fruit and vegetable juices and warm broths. Consuming lots of liquids (water, juices, broth) helps keep the secretions thinner, so they can be flushed out of your system faster, which helps alleviate symptoms such as a cough or nasal drainage. What are your common cold remedies? Disclaimer: I am not a doctor or a nurse. These are just tips that seem to have worked for me. Obviously, if you're feeling more than a moderate cold, please see your doctor and follow any instructions you receive. Great tips! I hope you are feeling better. I tend to eat when I'm sick as if eating a lot of food will somehow make me feel better?! But I agree, drinking tons of fluids helps!! I make it a point to bump up my vitamin c intake when I'm feeling under the weather! I hope you get to feeling better soon! I hate when a cold hangs on. I had no idea about the liquids. I always thought they went hand-in-hand with illness because it's easier to stick to liquids and they keep you hydrated. It may not be pretty to think about thinning secretions, but that is some interesting stuff! :). Thanks so much for linking up at Tips and Tricks Tuesday! Yeah. I'd always thought of it as a hydration thing before, too, but this makes total sense. Super good tips. I hope I've had my one and only cold for the year. It was a yucky one, so I'm doing all the hand washing and trying to stay healthy for no repeats!